Make Your Own Pop Tarts! It’s (Pretty) Easy. Pop Tarts were gone so fast it was hard to take a good picture. 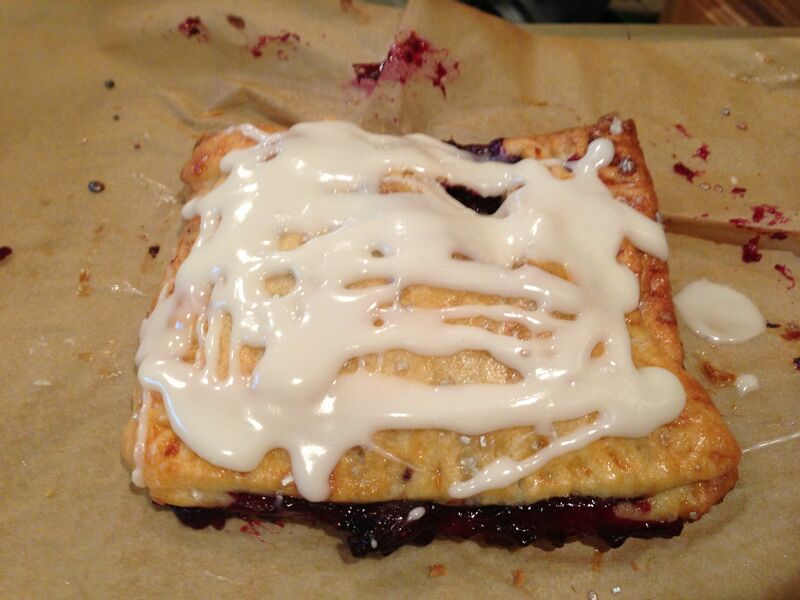 Here are a few frosted pastry survivors. One of the things I am always focused on as a parent is getting my kids to eat healthy. But this is a RELATIVE term because “healthy” in the end is measured by degrees, and is by no means an absolute. For instance, you are not often given the choice of “salad with quinoa or chicken nuggets with fries.” In most cases you have to make a decision which I would call “the best of the worst.” Which has the most overall net positive effect? Which is actually worse for my kids? This overall quest has led me to try to make things at home that my kids like or have liked in their store-bought versions. While a home-made Reese’s Peanut Butter cup may be no healthier than the crisply-orange wrapped retail alternative, I certainly feel better about it because to a higher degree I know what it’s in it. Of course, I can’t be sure what’s in ANYTHING today, but as I said, it’s all about degrees. In this category, I have experimented with Reese’s Peanut Butter Cups, Cheez-Its, and those horrible packages of crackers that come in vending machines with peanut butter or cheese in them. This week I had an assignment to bake for a gathering, and I was kind of stuck for ideas. Then, I saw the King Arthur Recipe for “Hand Pies,” or what most of us would call Pop-Tarts. This was an excitingly easy recipe with lots of great reviews (“easy!”, “delicious!”) so I realized I had to make them immediately. But there problems. For starters, the deceptively simple filling recipe called for Instant ClearJel, which I understand is one of the greatest baking products known to man, but it might as well have been a time-machine, since I didn’t have any and wasn’t going to order it and wait to make my own pop tarts. This was not for lack of trying though, it is not sold through grocery stores. I know because I called everybody. Ultimately, this would require a dreaded substitution. Secondly, their recipe didn’t specify a frosting, only an egg wash with shimmering sugar. Now I don’t know about you, but I never liked the unfrosted pop-tarts. Sure, they’re better for you (by degrees) but not as yummy. That crackly, be-sprinkled top was the best part! So, I had some research to do. I had to figure out a filling AND an icing. And that was even before I realized that cutting out 16 3.5 squares requires a mathematical skill I didn’t possess and a steady hand which I could not provide. So much for consistency of product! I knew I better make it taste good, because it was likely going to look amateurish. So I started out with the King Arthur Flour recipe for the dough. As with most pie-type doughs, you combine dry ingredients first; then add the butter until thoroughly mixed but big pieces of butter remain. Then add the sour cream and knead until cohesive. The directions said this would take some doing but it came together right away for me. Fold a few times (this is detailed in the KA instructions) and chill overnight. For the filling I read a lot about substituting corn starch for ClearJel but I’m not a big corn starch fan, so after some research I decided on Minute Tapioca. 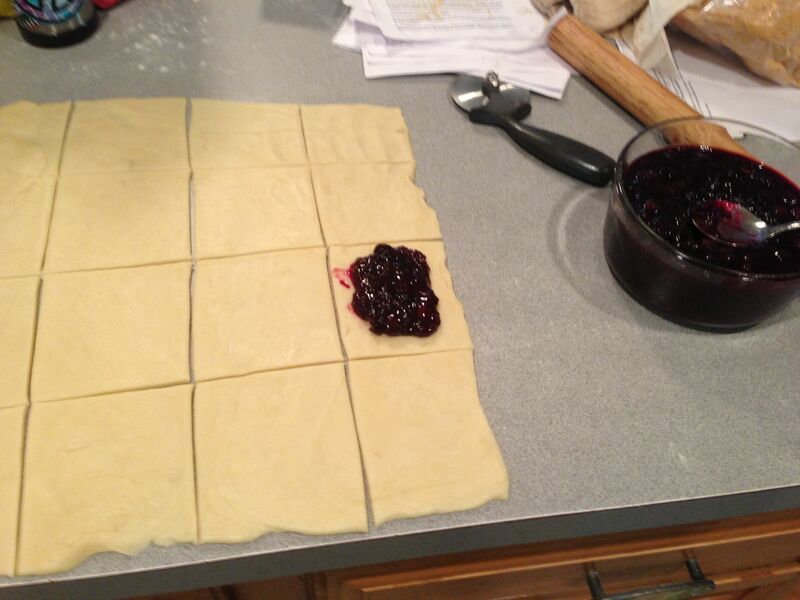 I have had a LOT of success making quick-pies with it in the past, so I figured I would do the trick. I modified it according to a Cook’s Illustrated recommendation to make sure blueberry pie filling doesn’t get too sweet: add apple and more lemon. I put my 4 cups of fresh blueberries into a bowl, and added the other ingredients, then waited 15 minutes as instructed. Then I realized: whoops, you’re supposed to cook it in the pie! That wasn’t going to work, not only because the pie dough wasn’t going to be ready any time soon but its cooking time (20 minutes) meant it might not be sugary and bubbly when complete. So, I dumped it in a saucepan and simmered it for 45 minutes. Bravo! It was perfect. I cooled it down and stored it overnight in the fridge. IT WAS DELICIOUS. Not too sweet, and not too clumpy. 1/2 shredded apple, something sour, like a granny smith or honey crisp. Assemble ingredients in a stainless steel bowl and after thoroughly mixing, let sit for 15 minutes. Heat on low for 45 minutes. Cool down before storing overnight. Unlike pizza dough or bread dough, this dough, filled with artery-blocking sour cream, rolls out fairly easily and stays where you put it. That’s good because otherwise trying to shape it into a 14 x 14 rectangle (as directed by KA) would be impossible. As it was, I needed a ruler, which made me feel silly, because all I had was my daughter’s wooden school ruler. Dusting the counter with flour was a requirement and I did have to re-roll the whole thing a few times to correct for shape, thickness and other problems. Once I cut out 8 3.5 squares (mas o menos) I was ready to add the filling. I had read of lot from make your own Pop-Tart pioneers about how once they made their creations they were sad with the final product because there wasn’t enough filling. I made sure that didn’t happen. I filled them to the edge, which was practically their breaking point, especially given the thin and erratically shaped dough squares I was working with. I did apply the egg wash and shimmering sugar because at that point I was in doubt about finding a good glaze. Ultimately, I glazed over it and it was fine. I put them in the over at 425 degrees for 20 minutes. They came out beautifully golden, but a few of them ‘bled’ due to improper sealing and forking. I cooled them on the baking rack while I made the glaze. The recipe I found, from food.com, was substantially similar to all the other recipes I found about a hardening glaze. Many of them called for almond extract, which I never use (due to a tragic marzipan incident in my youth) and some called for lemon, which I also avoided. Ultimately, it has to have a taste so I added a small amount of salt and vanilla. It also has to be ‘drippable’ (read: maybe add more milk) to make it work. The corn syrup may seize up in your mixer, so be prepared to work fast. Finished Pop-Tart aka Frosted Toaster Pastry. I had originally thought I would artistically cover the pastry but I ended up with a Pollack-like dripping. When I was finished, all I could think of was the “Nailed It” Pinterest meme, where home bakers attempt to make things made by professionals and the results are heartbreakingly hilarious. Alls well that ends well, though, as these “hand pies” were the hit of the evening— folks were kvelling over them, and ultimately the remains were taken home by the lucky and the salivating, so maybe a not a direct hit on the target, but off by only a few degrees. Optional: 2 tablespoons citrus (I used the clementine, but you could use lemon or orange). Mix everything (except the citrus) in a bowl and let sit for a minimum of 15 minutes. Then, transfer to a small pot and slowly bring to a boil, taste and correct with citrus if necessary, and simmer for about 40 minutes at low heat. Cool before storing. Best and easiest to work with when completely cool. I use a small ice cream scooper to place the filling. Of course everybody loves a hot glazed home made pastry! That is why it is so important to limit their size. So, I found you can do a little better if you size them 3.5 tall and only 3″ wide. (Of course you can make them any size you want). So far, these seem like the right size though with every reduction you have to be mindful that’s less filling you can add. Posted in Desserts and tagged baking for kids, blueberry filled pop tarts, frosted blueberry pop tarts, frosted toaster pastry, home made pop tarts, make pop tarts from scratch, make your own blueberry pop tarts, Make your own toaster pastry, pop tarts at home, pop tarts for kids at home, pop tarts recipe, Pop-Tarts, Robert deutsch, Toaster Pastry on June 28, 2014 by Robert Deutsch.